What the team known for Respected insurance practice known for providing legal opinions to insurance companies. Areas of strength span consultancy, administrative law and litigation matters. Senior statesman Antonio Penteado Mendonça remains a recognised practitioner in insurance law. Sources highlight him as an influential lawyer, nothing: “He’s an important name in the market.” He is also lauded for his academic background. Penteado Mendonça e Char Advocacia is a law firm created to fulfill the legal needs of its clients. Because of this the firm was planned and developed to act with maximum efficiency with the best cost/benefit. Penteado Mendonça e Char Advocacia has inherited a legal tradition that began in 1860 when the first member of five generations of attorneys graduated from the law school currently known as the São Paulo University Law School (Faculdade de Direito da Universidade de São Paulo, originally Faculdade de Direito do Largo São Francisco) the first and foremost law school in Brazil to date. Penteado Mendonça e Char Advocacia is in the direct succession line of Joaquim Mendonça, Antonio Machado Mendonça and Jorge Mesquita Mendonça law firms, a reputable name that has been part of the state of São Paulo legal scenario for over a century. The managing partner is Antonio Penteado Mendonça, who is a fifth generation heir to the lawyers that graduated from USP`s (University of São Paulo) Faculdade de Direito. The second partner is Armando Char, who is Graduated from Universidade Mackenzie and specialized in insurance at FIA-FEA – USP (University of São Paulo). He teaches the subjects “Liability Risks”, “Insurance Activity – Legal Aspects” and “Non-Financial Risk Management” for FIA-FEA-USP`S post graduation courses. Both partners have highly respected names in the Brazilian legal scenario in the areas of insurance and reinsurance and in the other legal areas in which the firm works, specially in general liabilities. Penteado Mendonça e Char Advocacia has as it goals to provide the best professional service, acting ethically and with total transparency, upholding legal principies, and to respect, value and interact with its clients, creating a long lasting professional relationships based on reliable services. 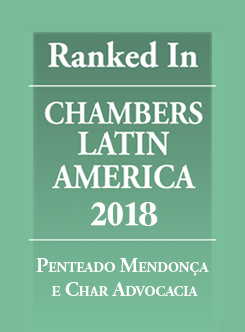 The firm and its senior partner have received the recognition of several organisations, like being top ranked uninterruptedly since 2009 in Chambers Latin America, Who’s Who Legal, Who’s Who of Insurance & Reinsurance Lawyers and International Who’s Who of Business Lawyers, as well as in Análise Advocacia-Os mais admirados in 2009.